Corto is not meant to be a realistic character — he’s an engine for our imagination. Pratt’s genius in those stories, and I mean right up to the very end — or at least until the penultimate Corto book, Elvetiche (the last, MU, is coasting a bit) — is to engage our taste for adventure in unexpected, almost dreamlike ways. By taking such a consistently original approach to the adventure genre, luring us with his charm and wit, then circumventing our expectations — both through plot and in his poetic sequences of picture narration — he achieves a kind of ambiguity of feeling, a slightly melancholy suggestion of those far reaches of our imagination that we can only access in flashes of inspiration, and only rarely if ever on a voluntary basis. With Pratt, adventure and romance are issues of our subconscious, essential embodiments of our aspirations. Yes, The Blue Lotus [is] pretty manichean when it comes to who’s the good guy and who’s the bad guy, but [this is] really incidental to what makes [it] great… The Blue Lotus is an unforgettably visualised, ideal portrayal of friendship and universality that eventually stretches across most of Hergé’s oeuvre, informing it at its core. Upon further thought, the manichean aspects of this and other Tintin stories are not incidental to what makes them great. 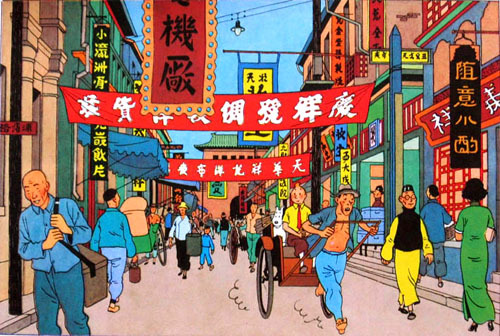 Tintin is an ideal projection of a universalist, moral world view anchored in scoutism, which had been a formative influence upon Hergé in his youth. Tintin is emphatically about the good in us, which is why Tintin — the embodiment of this ideal — fights villains of unambiguous moral turpitude. Hergé makes use of this archetypical conflict of good versus evil to promulgate an ethos of humanity, equality and brotherhood without ever becoming moralising. Later in his career, he moved away from this approach, and it is telling that the first story to eschew the manichean is Tintin in Tibet, whose origins — both in terms of plot and theme — lay in The Blue Lotus. Thanks for defending the masters.. It’s all too easy to forget, when one is engrossed in trying to look smarter than the rest, how much vision it took on their part to build their body of work at the dawn of comic history, and how astonishing it is that they even though they were the product of a certain age’s expectations and restrictions, they still endure. Classics are classics for a reason, no matter how many people think it’s fashionable to descry them. Thanks for the kind words. I find it useful to think about what makes these great works tick, and what better opportunity than when they’re attacked on such fundamental and definite grounds?